Is your child wild for all things Madagascar? Then she’s going to love this printable Madagascar early math worksheet! While Gloria tries to balance on the tightrope with Marty and Melman on her back, she needs your child’s help with other things. Ask your child to identify and circle all the 4’s in the worksheet. How many are there in all? This worksheet is perfect for practicing visual discrimination and number recognition. 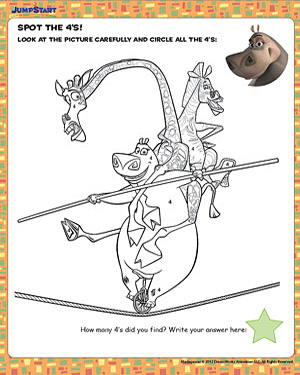 For extra fun, use it as a Madagascar coloring worksheet when you’re done.